#5 by Essous and #6 by Mujos. Tracks 3&4 are by Orchestre Cercul. #3 written by Henry Biby de Massouka and #4 by Franklin Boukaka. Some fireworks saved for you at the end of the year, cheers. This entry was posted in Cha cha cha, Congo, Merengue, Pachanga, Rumba by Moos. Bookmark the permalink. Take a look at this cover. Is it a very skinny young man we see ? Or is it a woman with beard ? What do you think ? hum, I prefer the fur of the women of your Christmas compilation. By the way is there any possibility to get the email or the phone number of those wonderful creatures ? Thank you for ending the year with Congolese music – will the new year also begin with this hot genre? Happy New Year to Moos and the entire Global Groove family! Apurva from Pune, India. What a great post, Moos! Thanks very much. I hope you can find the other volumes and share them in the New Year. I bet it will be a great one over here at GG! Cheers! Thanks for all of the great music & all the Best for the New year! With no further adieus, Moos, thank youze! Thank you very much for all the 100s of best african and carribean music that you’ve given back to the memory of the world! I have collected all. To open your blog is the first what I do if I come home from work (after the kiss for my wife) and I’m always surprised. Strangely, this compilation was originally released in 1960s in the UK, on the Parlophone label, entitled ‘Bridge Over The Congo’, which presumably explains the odd title of this version. 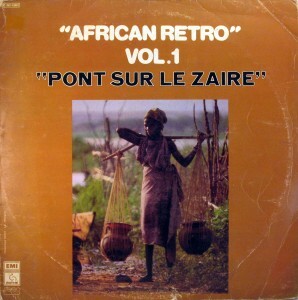 It’s one of the very rarest UK African LPs. I got a cassette dub of it many years ago, missing the last track, so I am absolutely delighted to get this rip with its superior sound and full complement of tracks. Many thanks, as always,and Happy New Year. Can you reupload? The link is not valid any more.